More economical and compact than other sanitary mount mixers, the modular design can accommodate from 1/8 - 1 HP motors. The mixer is suitable for batch sizes between 20-250 liters and is currently used in pharmaceutical, food & dairy, and chemical processing applications. The BRx series mixers were developed to be a modular and scalable design allowing for a host of mounting configurations, motors, seal designs and impeller types. The basis of the design is the seal housing which is constructed of 316SS with ground and polished welds that are suitable for CIP. The seal housing is adjustable to accommodate lip seals, single mechanical seals and double mechanical seals. The mount mixer is available from 1/8 to 1 HP with either Chemical Severe Duty or Washdown Duty, Paint Free or all stainless motors. Mixer shafts are available up to 30" in length with the standard being 316SS, however Hastelloy B and C is available as are Teflon, Kynar and other coatings. We offer sanitary finishes to match your specifications, from a 20 RA to a mirror finish. The standard impellers are square pitch propellers providing low shear, high flow performance. Radial impellers, axial flow turbines, Rushton turbines and upflow impellers are also available. The BRX is ideally suited for sanitary and research environments where small, valuable batches require Triclover-T mounting. 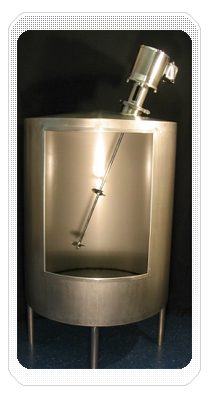 Applications include solids suspension, blending, chemical reactions and promoting batch uniformity. FDA approved variable speed drives with stainless steel enclosures are offered for multiple mixing applications in the same tank or for handling sensitive ingredients requiring less agitation.